I NEVER do this! I NEVER give a review for a book that I haven't read from cover to cover, however; I am going to give you all a heads up about a book I think will be the next BIG thing! 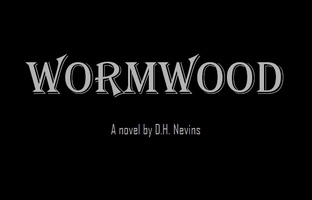 Wormwood is a post-apocalyptic novel by D.H. Nevins. I happened across D.H. Nevins website thanks to Twitter. While I have perused many a websites and never been tempted to hang around long, I can safely say that Ms. Nevins held me captive for quite some time as I read through the first five chapters of her post apocalyptic tale, Wormwood. I read often, turning the pages of several books a week, and not since I picked up The Hunger Games by Suzanne Collins, have I been so enraptured by what I was reading! Ms. Nevins writing is sheer genius, well thought out, extremely well written, and polished to perfection. I have been left ready to beg for the next few chapters, the rest of the story, and sorry for the fact that I will have to wait to finish this amazing bit of fiction! Wormwood is a book I want on my shelf, in my collection, to be able to pick up and return to on a whim, and I have only read the first five chapters! I can only imagine the impact the rest of the book will have! Wormwood is slated for release in Sept. 2011. September is going to be an extraordinary month indeed! Do yourself a favor and go read the first five chapters, then wait patiently with the rest of us as we queue up for that Sept. release! Tiamat and his brothers, a legion of one hundred Nephilim, have orders to send all humans on to their final judgment. Yet in a moment of weakness, Tiamat risks his life to rescue a hiker named Kali from the very destruction that he initiated—a choice that thrusts Kali from the safety of her world into the boundless hell of his. Set across the landscape of a freshly devastated Earth, Wormwood follows the intertwined paths of the high-ranking, but tormented half-angel named Tiamat, and Kali, a woman who will do almost anything to survive—even if it means facing a devastating truth. I always believed that I was nothing special. Now, after The Cleansing, I am left to wander the wasted landscape alone. Yet I am continually tormented by one of the Nephilim—a half-angel named Tiamat—who claims that I must stay alive to fulfil some purpose. He risked his life to rescue mine; a seemingly virtuous deed. It also appears as though every task Tiamat is ordered to carry out tears at his soul; but how can I know if that’s true? How can I trust him, if he’s the very one that destroyed this planet in the first place? Kali, thrust from the surety of her world into the boundless hell of Tiamat’s, must try to find a way to survive in the Earth’s vast, devastated landscape. Plagued by a legion of Nephilim bent on sending her on, she is forced to trust the one being that could prove to be her greatest enemy.